Maastricht Treaty The name Maastricht Treaty relates to the name of one Dutch town. In 1991 the 12 members of the to-be European Union met in the Dutch town named Maastricht and discussed the creation of the European Union. The Maastricht Treaty created the European Union as we know it today and led to the creation of the euro. These states agreed to set up a single currency as part of a drive towards the European Economic and Monetary Union. The Maastricht Treaty (officially called the Treaty on European Union) was signed on February 7, 1992 and entered into force on November 1, 1993. The Maastricht Treaty was created by the following countries: Belgium, Denmark, Germany, Greece, Spain, France, Ireland, Italy, Luxembourg, the Netherlands, Portugal, and the United Kingdom. States participating in the creation of the Maastricht Treaty agreed on strict criteria (called Maastricht Treaty criteria or short Maastricht criteria) for joining. Every state that wants to use the euro and be part of the Union needs to comply with the Maastricht Treaty and these criteria. The Maastricht Treaty involved three pillars of the European Union. 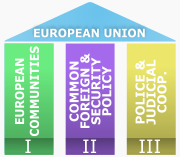 The first pillar described in the Maastricht Treaty was the European Community (EC) pillar. This pillar is based on the principle of supranationalism, which means that EU member states should cooperate with each other to achieve common goals. These states share the Union's supra-national institutions — the Commission, the European Parliament and the Court of Justice — which have the most power. The Common Foreign and Security Policy (CFSP) is the second pillar of the Maastricht Treaty and places emphasis on coordination in foreign policy. The Justice and Home Affairs (JHA) pillar is the third ground stone of the Maastricht Treaty. The euro was supposed to tie all these pillars together as put in the Maastricht Treaty. Per the Maastricht Treaty criteria, the European Central Bank was established to set interest rates. Britain and Denmark opted out of these Maastricht Treaty plans. Basic fact: The Maastricht Treaty entered into force on November 1, 1993 and is the founding document of the European Union.